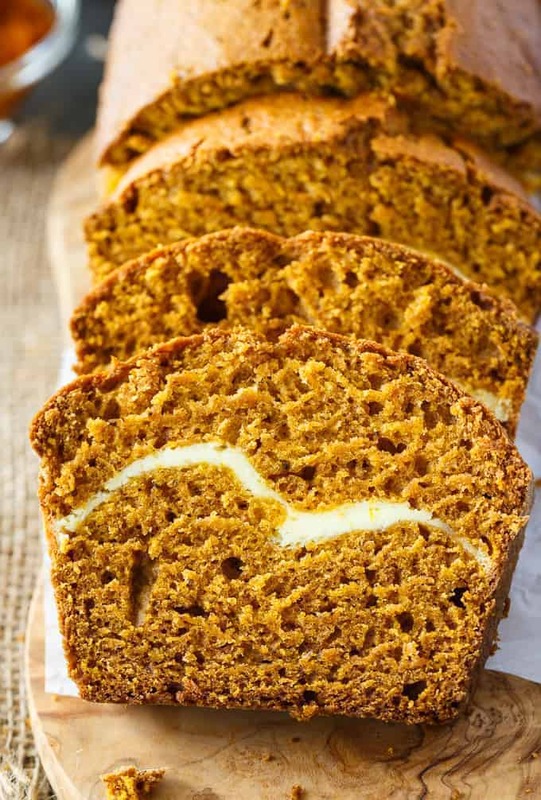 This Pumpkin Ribbon Bread is a MUST-TRY for all you pumpkin lovers out there. I love this time of year when the weather starts to cool down and the leaves begin to fall and change colours. What I think I love the most, however, is that it’s pumpkin season. Give me alllllll the pumpkins, please! It looks like a regular loaf of bread. That is, until you cut the first slice. Inside you’ll discover a lusciously sweet and creamy cheesecake filling with just the slightest hint of orange flavour. It takes a good hour and a half to bake, but it’s well worth the wait. You don’t even need to slather any toppings on this bread. Dessert or snack….you decide. I’ll take a slice with my morning coffee, thank you very much. This recipe makes two generous sized loaves so you can pop one in the freezer to save for later or give a loaf to family or friends. Or just keep it for yourself. That’s what I did! I didn’t want to share this deliciousness. You’ll want to store the loaves in your fridge to keep them fresh. My youngest daughter, who is notoriously picky, even enjoyed a slice. Surprise, surprise. For more yummy pumpkin desserts, try my White Chocolate Pumpkin Cheesecake, Pumpkin Pie Cupcakes and Pumpkin Breakfast Cookies. You might also like this Zucchini Bread and Pineapple Cheese Bread. 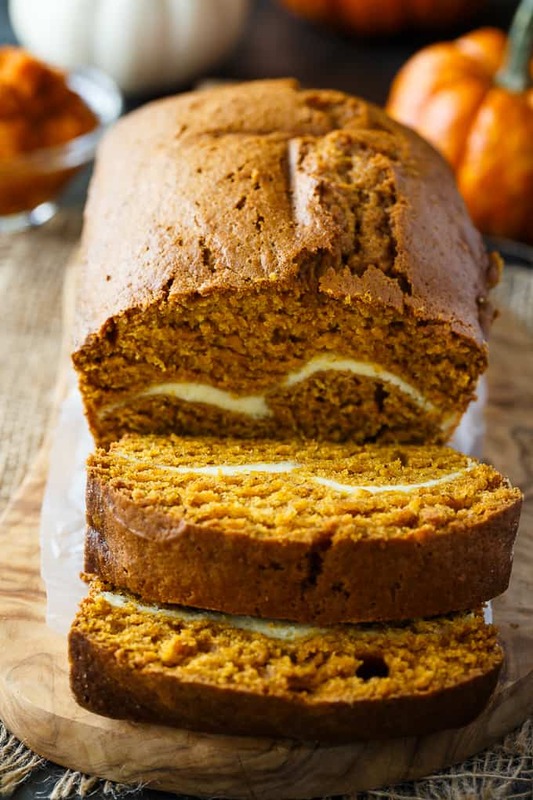 What pumpkin recipes are you baking these days? 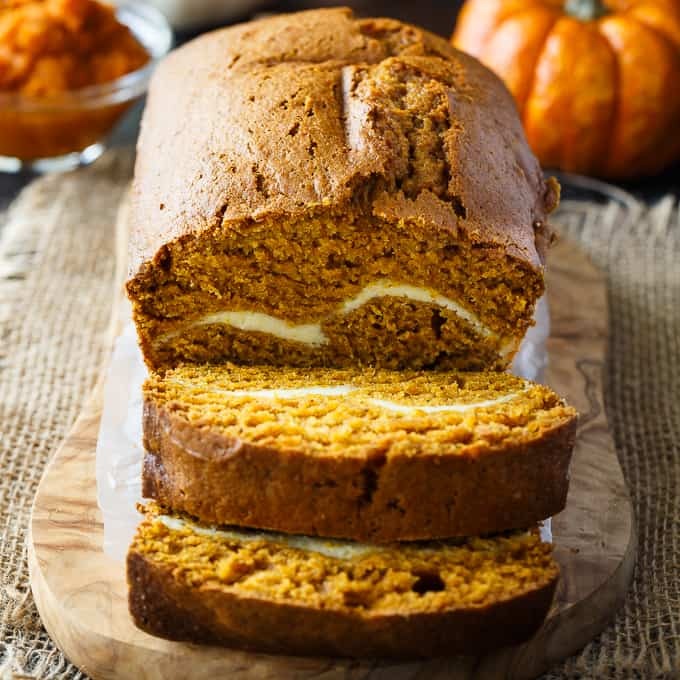 Moist, delicious and packed full of pumpkin flavour. You’ll love the decadent and creamy cheesecake filling inside every slice. Beat together cream cheese, sugar and flour. Add egg and stir to combine. Stir in orange peel. Set aside. In large bowl, stir together pumpkin, oil and eggs. Add in sugar, salt, cloves, cinnamon, flour and baking soda. Stir. Pour 1/2 the batter into two greased and floured loaf pans. Spread cream cheese mixture over batter in pans. Add remaining batter to cover filling. Bake for 1 1/2 hours or until a toothpick comes out clean. Cool 10 to 15 minutes before removing from the pan. Store in fridge. This looks like an amazing bread. What a delicious looking bread! I bet the filling makes it. This bread looks so delicious,,Now that the weather is finally cooler I can start baking and will give this a try. I am loving the ‘ribbon’ in this bread. 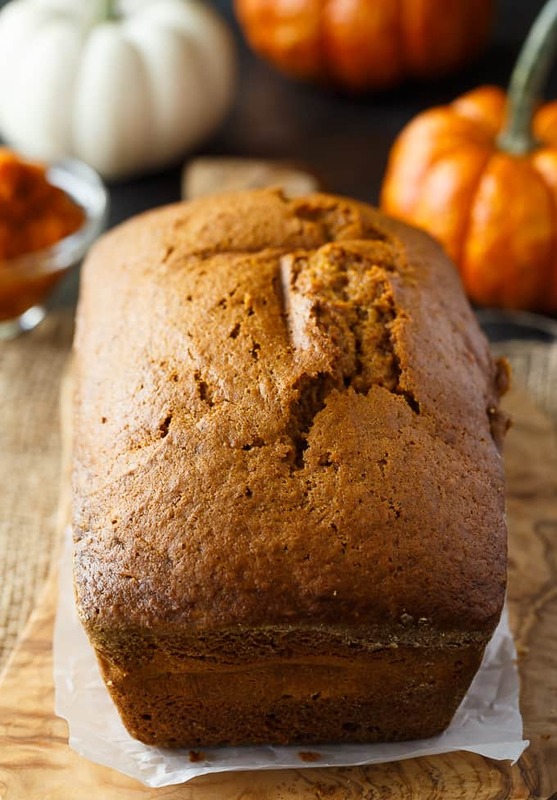 I like pumpkin bread and this would change the atste for something a bit different. Frosting on the inside! Looks so good. Looks scrumptious! I’ve never tried to add a ribbon to a bread before. I love so many of your amazing recipes! I am going to make this delicious bread! It is amazing. MMMmmmm… This look’s amazing.. I am going to have to try and make it.. Thanks..
Tis the season for everything pumpkin. Sounds delicious! Yummy! How great it would be to have a slice with my coffee right about now! Wow, this looks stunning and such a fabulous golden colour! That filling sounds so good & solves any dry bread issues I bet! I just pinned your delicious bread, can’t wait to try it! Thanks so much for sharing your post with us at Full Plate Thursday! Have a great week and come back to see us real soon! This bread looks so good! Definitely pinned to try later! 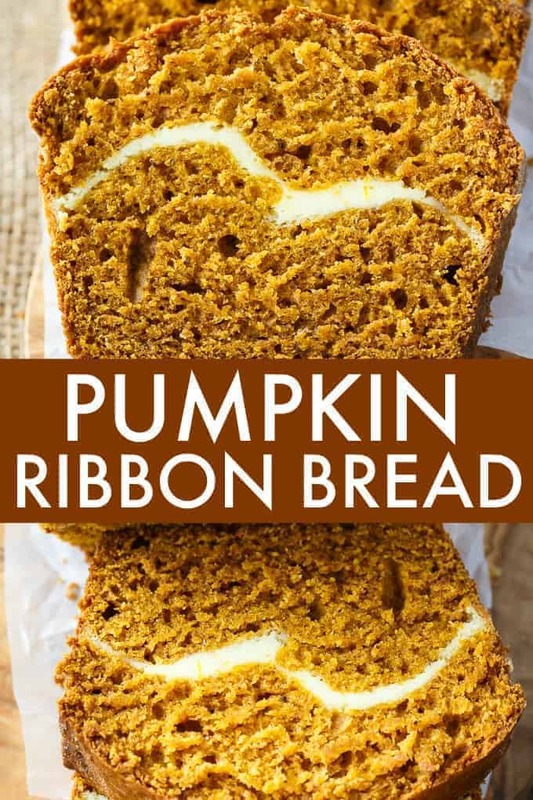 I’m not a fan of pumpkin but I do like how you got that ribbon in there, did it just happen on it’s own that it was wavy or did you have to do something? It just naturally went that way!